This is the kind of stock which might bounce back post new year. All those who want to take loss this year for tax purpose will sell it. In fact lot of stocks in the mortgage sector look like being sold for tax reason and might bounce back strongly. If you have to play the seasonality game, you have to think much ahead of the cycle. I have many alarms set for various seasonal strategies. One of the alarms went off today for the summer stocks. Stocks of companies that have bulk of their sales in summer season. The market is anticipatory mechanism and many times stocks breakout much ahead of the season in anticipation. The retail sector is one sector where this happens regularly. So you have to think 4-6 months in advance to profit from these seasonal tendencies. So if you are looking for summer stocks focus on leisure, entertainment, travel, teenage clothing, beer and beverages, lawn care and few other sectors. Like January effect there is a summer effect for some stocks and sectors. Volcom, Inc. VLCM is one of those sun and sand kind of play, which is finding some buying interest today. The Barrons is a pretty useless publication due to its editors perma bear stance. They should just fire Alan Abelson, he has been consistently and irrationally bearish for much of his editorship plus his cognitive bias has made the publication pretty useless for serious speculators . So I do not subscribe to it, but last week I was going through the past issues at the library as part of the year end review and I found one interesting anomaly about high debt companies. Now this is the kind of information which is useful fodder to think about. The link requires subscription. EXTRA RED ON A COMPANY'S BALANCE SHEET can mean more green in a stockholder's pocket. That's the surprising conclusion of a study of corporate debt ratios and stock prices by Narasimhan Jegadeesh, finance professor at Emory University's Goizueta Business School, and Clifton Green, associate professor at the school. After examining all publicly traded nonfinancial companies from 1974 to 2005, they found that companies with high debt levels relative to their peers boast superior stock-market returns. What can you say. 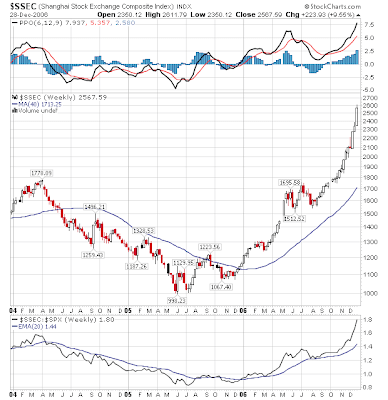 The Shanghai market is up how much % in one month? Just do the calculation. Is it telling something about world and US economy slowdown. Today is the last trading day of the year. It will be followed by 4 days holiday. So expect some crazy moves. Profit taking dominated the day. There is also some divergence between the DOW, S&P and NDX. The NDX is often the pilot fish on down moves. In last couple of weeks growth seems to be back in favor with many high EPS and IBD kinds plays finding bids.The large caps have been hibernating. Some stocks with good earnings in last earning season are breaking out after sideways move. For example PNSN broke out three days ago.There are many other stocks like PNSN, IGLD, RVSN, VDSI, GROW etc which have broken out of their range in last 3 days. Drugs/biotech seems to be shaping up as good theme. The biotechs move on news and regulatory action. The large cap biotechs have not been actively participating in some of this action. But keep an eye on some of the stocks in this list. Momentum is cyclical. lasts on index for few days but on individual stock can last for long time(on stocks with significant catalyst). So many of the stocks breaking out in last couple of days have more room to run, even if the overall market goes down. Obviously the pure momentum plays like FFHL and anything remotely to do with China still continues to offer free money for momentum players. The thing about such plays is unless you have an existing well organised system to identify them or anticipate them you should not play them. By the time you realise what happened the party gets over. Having pure momentum based systems in your arsenal is always an edge in most market circumstances. I have written extensively many times on how to approach this. In fact this year end I added more momentum based components to my systems and added few more momentum based black boxes. Momentum is cyclical. After a lacklustre few weeks the markets had couple of good momentum days. Today was profit taking day. On individual stocks momentum lasts longer than the Indexes. Many sector specific action is dominating the tape. When market falls in love with something, it offers opportunities for some quick and easy money. The Chinese stocks have been markets favorite for last couple of days. Everything related to China is up 5 to 30% plus in few days. Just see the list I posted couple of days ago. HMIN which I highlighted yesterday was up more than 10%. I have booked my profits on most China plays, you should bank profits on such plays when you have it. If you are looking for a Chinese play which is yet to make a big move, just look at ALLT. Besides China the other sector with similar opportunities currently is Biotech. These opportunities are only for the nimble traders. After a long time, earnings trend show a slowdown. The earning season will start next week and again offer profitable opportunities on both long and short side. With the S&P 500 up over 11% from its early August rally-point, investors are hoping for a strong fourth quarter to keep the upward momentum going. On the whole, analysts estimate that the median S&P 500 firm will show 9.7% year-over-year growth this quarter. If this happens, investors will likely be disappointed, as it would mark the first time in years growth was not double-digits. Positive analyst surprises, however, seem to be the recurring trend. With a median surprise similar to what we saw last quarter, the current reporting period could show actual earnings growth in the range of 11% to 13%. On a sector basis, quarterly earnings growth is expected to be highest in the Materials sector, at 16.3%. The low end of the growth scale belongs to both the Utilities and Telecom sectors, with expected comparable declines of 6.3% and 6.8%. For the full-year, the S&P 500 is now expected to show a healthy growth of just over 12%. What we are witnessing is a delayed Santa Claus rally. The volume was thin but the breadth was very good. All major sectors participated in this rally. Now these kinds of seasonal events are indicated by some of the anomalies I talked about yesterday. The January Effect is a well known anomaly. As more people follow it and become aware of it, such rallies have a self-fulfilling prophesies. If you want to profit from the January effect you need a systematic startegy to do so. If you are looking for ideas on how to profit from this once a year phenomenon study this article by Victor Niederhoffer and Laurel Kenner. They offer a template for identifying which stocks to buy using the Value Line. 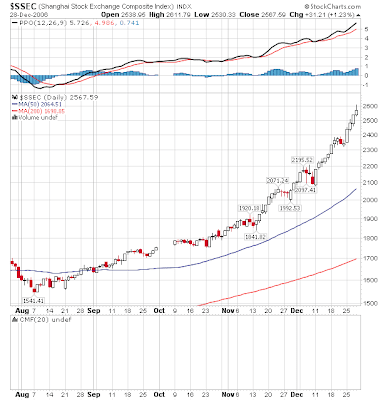 Whether it be the last month of the year, or the last week of the year as a precursor to the January effect, it is hard to deny that the season of bullishness is imminent. * The S&P 500 ($INX) index has closed up nine times out of 10 in December over November. The Nasdaq Composite ($COMPX) doesn't climb as often -- just 67% of the time -- but, when it's up, it climbs with greater ferocity. In January, the roles seem to be reversed -- while the S&P 500 index is up over December an appreciable 78% of the time, the Nasdaq is up a more consistent 83% of the time -- and with higher returns to boot. * The first week of January shows real optimism, with investors sending the Nasdaq 100 ($NDX.X) up by an average of 1.25% -- more than three times the rate of the S&P 500 index. It would seem that as the slates are wiped clean, investors are willing to give risk a chance and a sense of optimism yields a spring in the step in the middle of winter. The results suggest that a pairs trade long the Nasdaq 100 and short the S&P 500 would be appropriate as of the end of November. But the Speculators eschew a pairs trade as an equivalent to betting on a favorite to show in a horse race. Unless you are prepared for it, you can not profit from it. The only surprise about this rally is why it did not start pre Christmas. The action today was concentrated in small caps. As usual the China theme was still at work. If you are looking for China themed stock, yet to make wild run, just look at HMIN. Along with China. other international stocks were catching some bid. For nimble traders there were tons of opportunities in last two days. Momentum bursts like this are good for those who can anticipate and position for such moves. After two days of rally tomorrow may not be the best day to initiate new positions. A gap up would be sold aggressively as traders who anticipated the year end rally and bought before holidays or bought two days ago exit or book partial profits. The badly mauled bears may be waiting in the wing at higher level.